This is my first ChibiOS HAL driver, so I would really appreciate any and all feedback. It's not complete (no pwm/channel interrupt support) but PWM output does work. I just wanted to share what I've done so far just in case anyone else finds it useful. I don't have a logic analyzer or scope here at home so I can't verify that the timing is proper, but I went over the datasheet a million and a half times and the code looks correct. The demo is for the Freedom KL25Z board. It activates the accelerometer and modulates the RGB LED depending on board orientation. After completing the driver with channel interrupt support, I'll be looking at the ICU driver next since the same TPM block is used. I have both equipment and will test this tomorrow or in the weekend. utzig wrote: I have both equipment and will test this tomorrow or in the weekend. You rock! I'll try to grab my Saleae from work for this weekend... working blind is a pain. I appreciate you testing this and I especially appreciate the work you did for the Kinetis port! At 200Hz I measured 1ms low to 4ms high on for the 5ms period (my configuration is PWM_OUTPUT_ACTIVE_LOW). I finished the support for periodic and channel notifications via interrupts... it's way past my bedtime so I'll work up a new patch set tomorrow. I've been fighting with the kl25z.h CMSIS header... a lot of TPM references are typed TMP. I also made a change to the TPM_TypeDef structure to ease access to channel SC and V registers. I fixed the TMP* typos. Thank you! I've attached the finished PWM driver and demo. The stuff in kinetis_tpm.h might belong in kl25z.h... I wasn't sure. If you would prefer the defines in the CMSIS header, let me know and I'll move them and resubmit. Thank you for helping me with this, I really appreciate it! I commited the HAL driver. I also changed the TPM typedef to enable channel access with C[channel_number].SC, etc. I have not commited the demo yet because I want to merge it with the current main demo. Please update your SVN repo and review that everything is ok, I tested it here but always good having a second opinion. Ah, the other Kinetis MCUs (not KL) use a slightly different subsystem called Flexible Timer Module, or something like that, which is a superset of the TPM. The second version of the patch, attached to my last post, has interrupt and periodic/channel notification support. What I'll do is update my repository, and make a new incremental patch against what you've checked in. 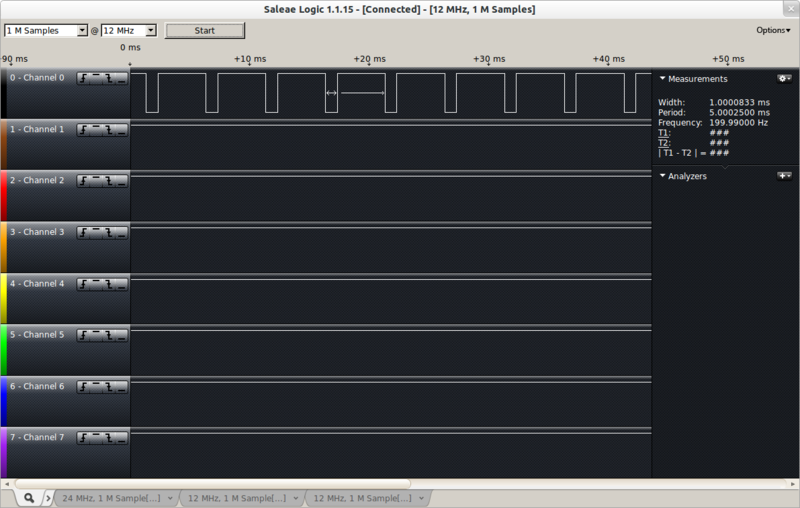 The main HAL pwm.c does channel bounds checking, so I'm not sure if we need it in the lld as well. But I've followed your examples and added them to the channel notification functions. Totally right. I removed the extra checking. Sorry for the previous mess up and thanks for everything!